A demonstration of nonlethal wolf deterrents sparked debate among livestock producers and conservationists Wednesday morning as representatives from Defenders of Wildlife attempted to reach out to the ranching public. Field technicians from the Wood River Wolf Project, an organization dedicated to helping wolves and sheep coexist, brought out air horns, portable spotlights and even a 5-month-old guard dog in an attempt to show the handful of ranchers in attendance what can be done to keep wolves out of their herds. "It's basically just to inform ranchers about the tools that are available," said Patrick Graham, project leader for the Wood River Wolf Project. "It's a generalization to say that all ranchers hate wolves. The ranchers we work with are understanding that predators are a part of the picture now." Nonlethal methods center on three main principles: closely supervising herds, avoiding wolves and scaring wolves away from livestock. These principles have been put to the test on the Lava Lake Lamb and Livestock ranch near Carey, where owner Brian Bean says the best tool for preventing depredation is sheer avoidance. "We don't want dead wolves and we don't want dead sheep," he said. "The best way to do that is by avoiding interaction." The most valuable tool for avoidance is telemetry, Bean said. Herders can use hand-held receivers to pick up signals from radio-collared wolves and move sheep bands away from packs. "If we know where the wolves are, we can minimize interaction," he said. "If we don't, our first indication that they are in the area is when we see them 200 yards from the sheep." But there are few if any radio-collared wolves in the region, which means ranchers must resort to other methods to protect their herds. One of the main methods used to frighten wolves away is called fladry, red vinyl flags sewn to lines or electric fencing and set up around livestock at night to deter packs. Carol Williamson, wife of retired U.S. Wildlife Services Agent Rick Williamson, sewed the first fladry for Defenders of Wildlife projects. She was also the one to come up with a solution for the wolves' tendency to test the fladry. Rick Williamson had noticed that wolves would stay away from fladry at first, but would eventually approach the lines, lunge at them and finally bite them to see if the flags were actually dangerous. "I said, 'Well, why can't we put it on electric fencing instead?'" Carol Williamson said. When the flags are attached to electric fencing, it's known as turbo fladry and is generally powered by solar generators. One mile of the turbo fladry costs $3,400, which has raised some concern among ranchers about the cost of nonlethal methods versus simply shooting the predators. 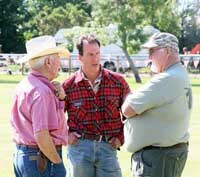 Blaine County Commissioner and Wood River Wolf Project liaison Larry Schoen said he invited several ranchers to come to the demonstration, but at least one said his operation was too small to be able to afford the methods Defenders of Wildlife supports. "It would be disingenuous to suggest it's cost-free," Bean admitted. "But what's the alternative?" Bean said his livestock losses have dropped from "dozens" per year into the single digits since he began working with the project. The fladry and dogs are effective against not only wolves but coyotes, which Bean said killed more sheep per year than wolves ever have. So far this year, Graham said, only five sheep have been lost on the project. That's more than previous years when the number has hovered from zero to two deaths, but Bean said part of that is due to the fact that it's harder to avoid wolves without radio collars. "Our ability to mitigate is less," he said. "It'll probably be worse than it has been." Making sure sheep and wolves avoid each other is enough of a challenge, but rancher John Peavey said working to limit interactions between cattle and wolves is even harder. Sheep form natural bands at night, and herders can easily set fladry pens up around the bands in 20 to 40 minutes. Peavey said he has cattle grazing over tens of thousands of acres of land, making it "impossible" to use fladry. "I haven't heard a solution," he told former state wildlife agents and conservationists. "I'm willing to try nonlethal if I think it will work." Carter Niemeyer, former U.S. Fish and Wildlife Service wolf recovery coordinator, said ranchers can set fladry around calving pens and protect calves during certain seasons, but there's almost no good solution for summer grazing. "Cattle is a tough thing," he admitted. "With the big grazing allotments, there's no silver bullet." Peavey said it would take his range riders two weeks to ride around the various bands of cattle, making nonlethal methods impossible. But Niemeyer said something has to be done, as lethal methods haven't successfully eliminated livestock depredations either. "Lethal is one thing and nonlethal is another," he said. "Neither has to eliminate the other." Niemeyer said he hoped there will eventually be a response team similar to U.S. Wildlife Services for nonlethal measures, with agents who can come in and set up fladry and camp out with sheep in problem areas. Still, he said, "there's going to be a need to remove some problem animals." Even Peavey said he's resigned to the fact that no matter what methods are used, wolves are on the landscape for the long haul. "There will be wolves where they won't get in trouble," he said.